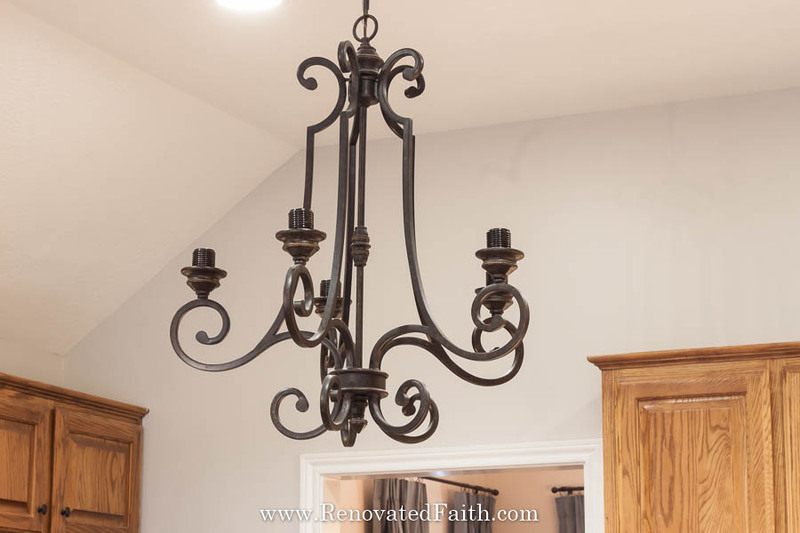 Imagine getting “new” kitchen and dining room light fixtures for only a fraction of the cost. Also imagine that feeling when you blow most of your kitchen renovation budget on lighting alone. The sticker shock from pricing out light fixtures online motivated me to update my current lighting with a few simple hacks. 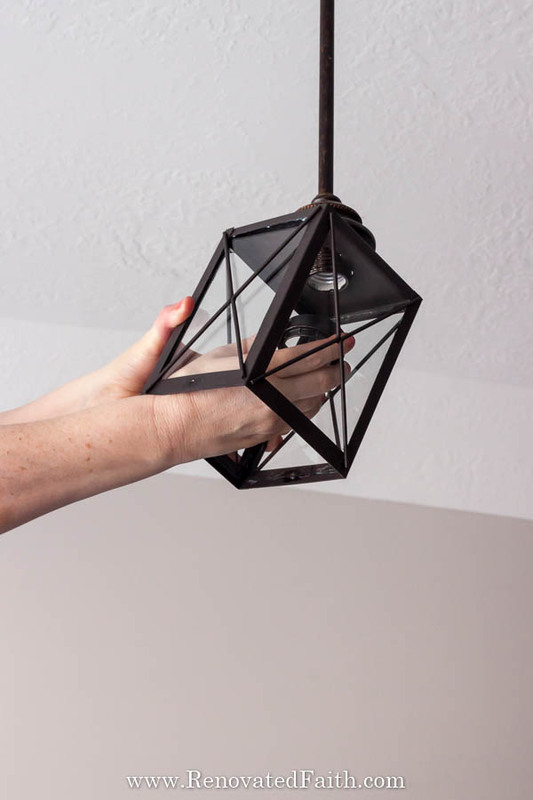 If you are ready to do some light fixture makeovers, I explain the steps of my diy light fixture updates that will modernize your lighting instantly! 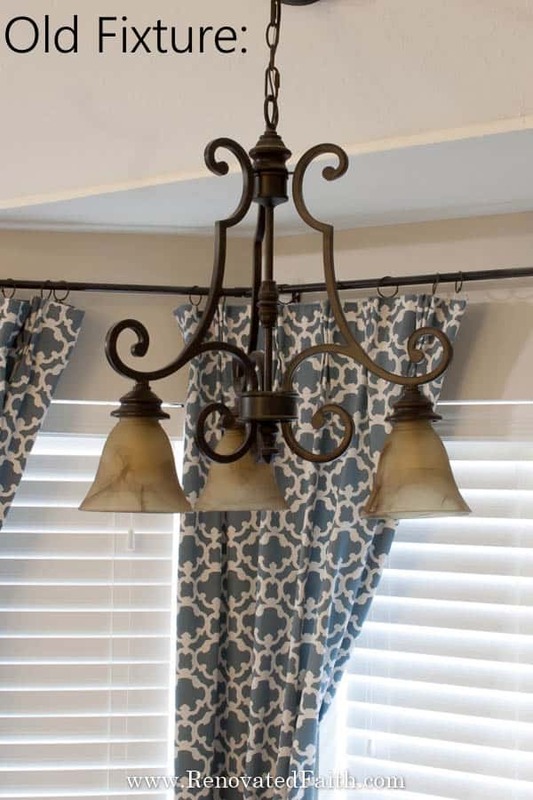 How to Update Light Fixture Shades – the Right Way! 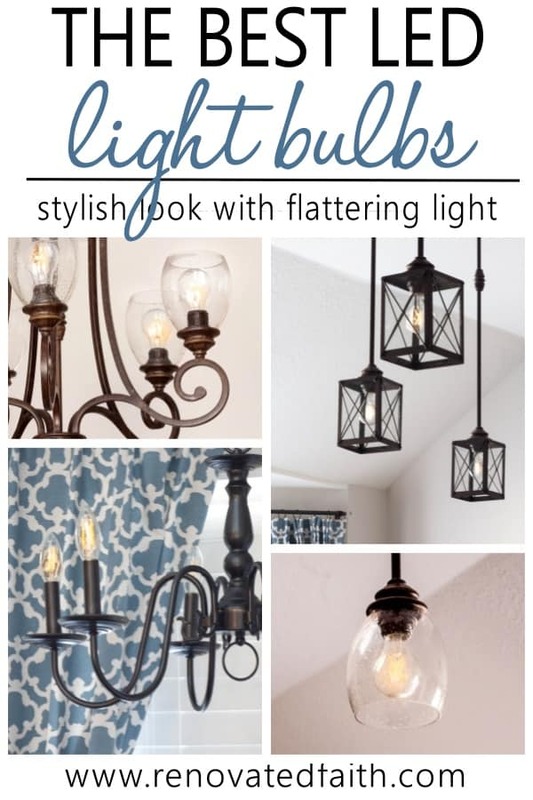 Now add a light bulb and you have a gorgeous pendant light for a fraction of the cost! 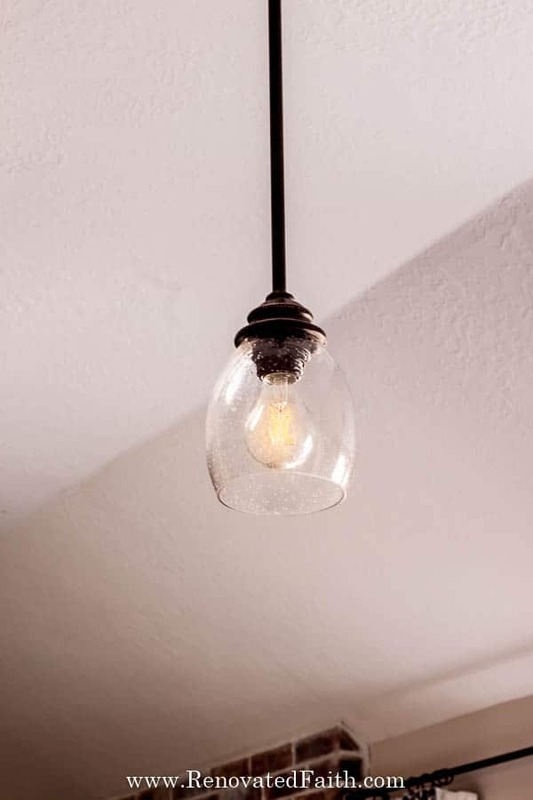 What are the Best Light Bulbs for Overhead Lighting? 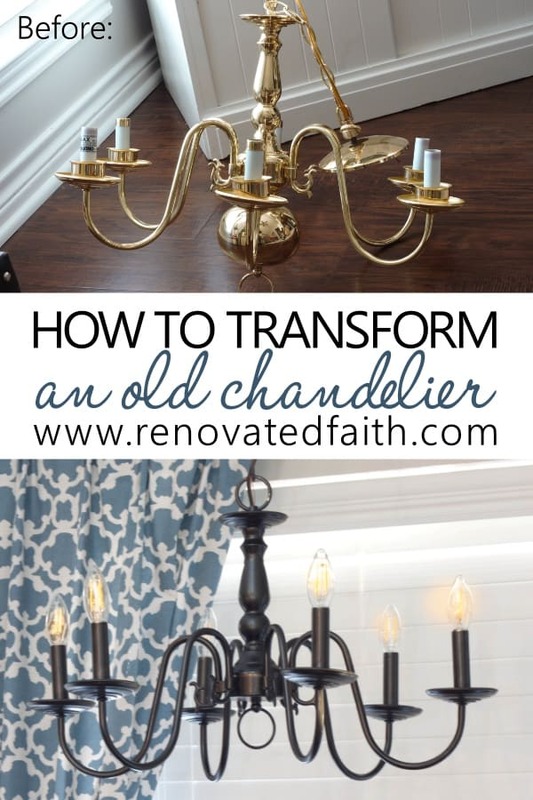 This post actually contains 4 different tutorials to give you lots of options for light fixture makeovers in your home. 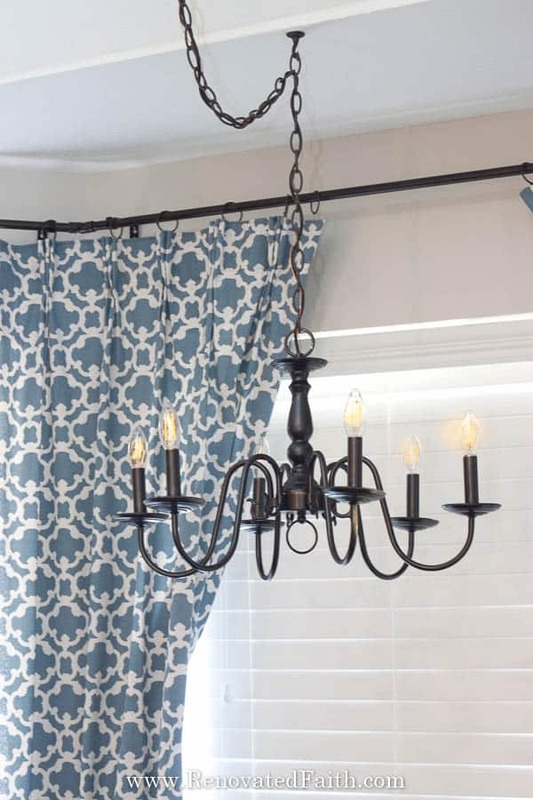 This way you can customize DIY your light fixture updates to your home’s style and also your budget. 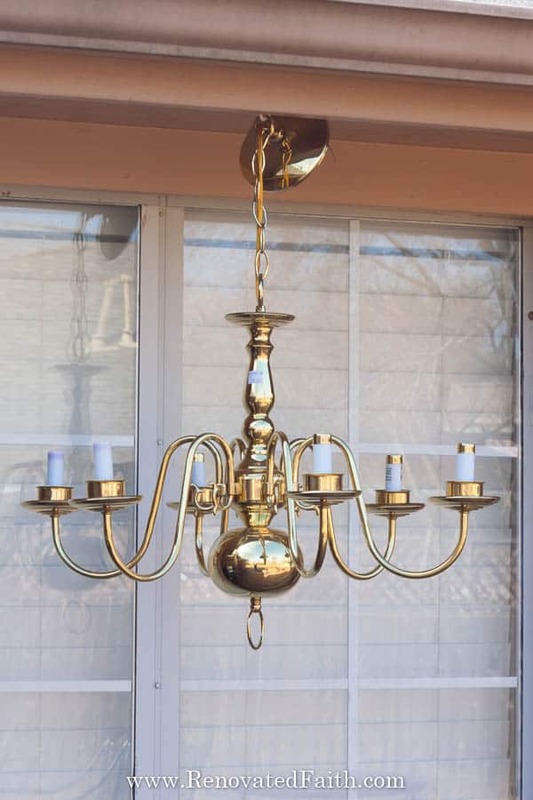 My favorite DIY light fixture update is this old brass chandelier I found at Restore. If you haven’t been to your local Restore, they are a great place to find old light fixtures that just need a little love. It’s also where I got the ceiling fan blades for my windmill wall art and the chandelier for my hummingbird feeder. I got this baby for $10! When I saw it, I knew it had some major potential to look like one of those elegant, feminine chandeliers you might see on Fixer Upper. Here is the chandelier that was already over our little breakfast table. 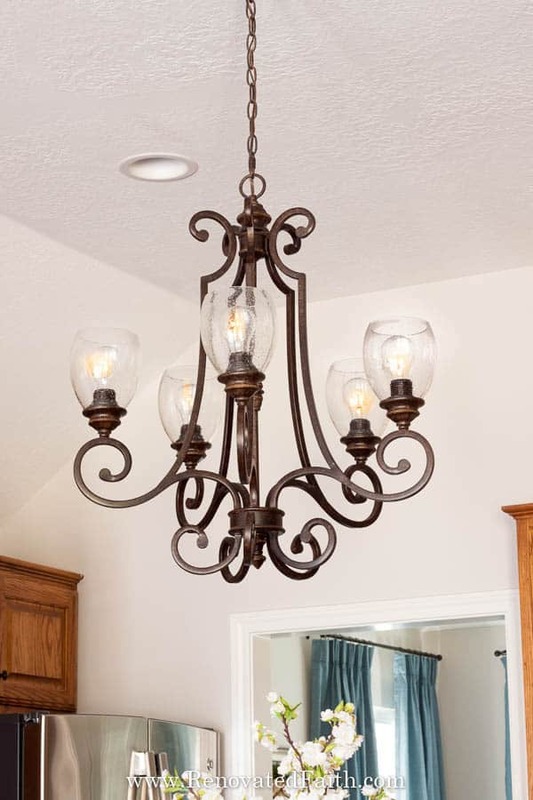 I knew I could just replace the sconces but honestly, I’ve never been a fan of the entire light fixture…. so, it had to go! Rustoleum Universal Metallics Oil Rubbed Bronze Spray Paint –You can get it here or at most home improvement stores. 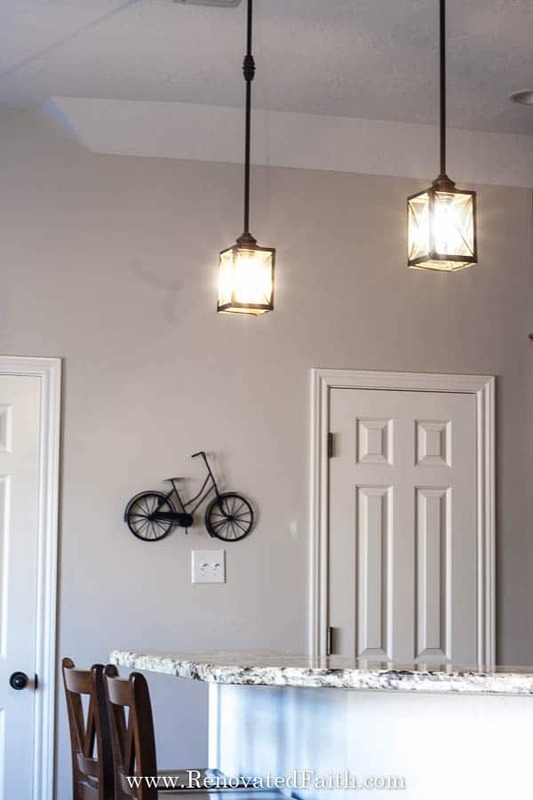 Since, these chandeliers were my inspiration, I knew I’d need to make some adjustments to give it a more modern farmhouse look. I took those little cups off of the bottom of the candle portion and also removed the tiny caps at the top of the candles. This gives it a sleeker, simpler look. For the same reason, I removed that large bulb part at the bottom. It turns out it just unscrewed and I add that ring back on the bottom of the chandelier. Now it’s time to paint!!! 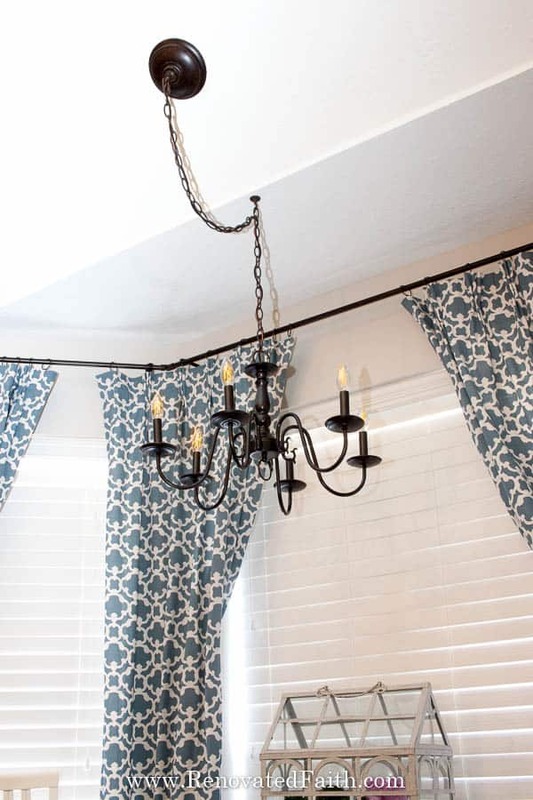 Wipe down the chandelier with a damp rag to remove any dust. Mine even had some dead bugs hiding in places. 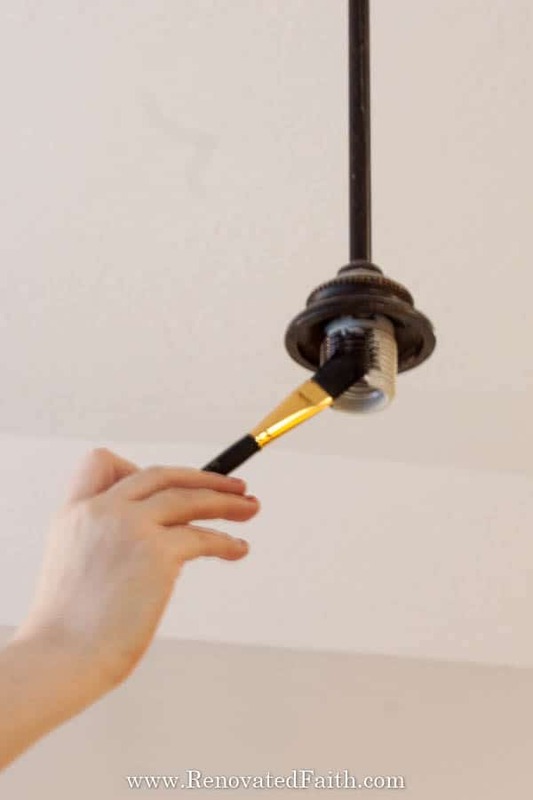 Also, use painter’s tape to tape off the portion where the light bulbs screw in just to ensure that the paint doesn’t gunk up any of the connections or internal threads. I learned when making my DIY Hummingbird Chandeliers that it is best to paint chandeliers by spraying the bottom first. 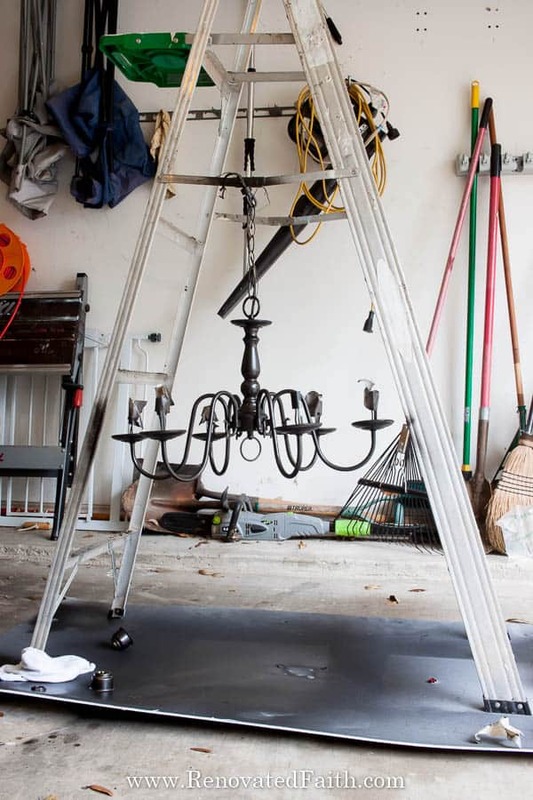 Lean the chandelier against something so you can spray the bottom with spray paint. Do one coat with the Rustoleum Universal Metallic and then come back about 10-15 minutes later for another coat. 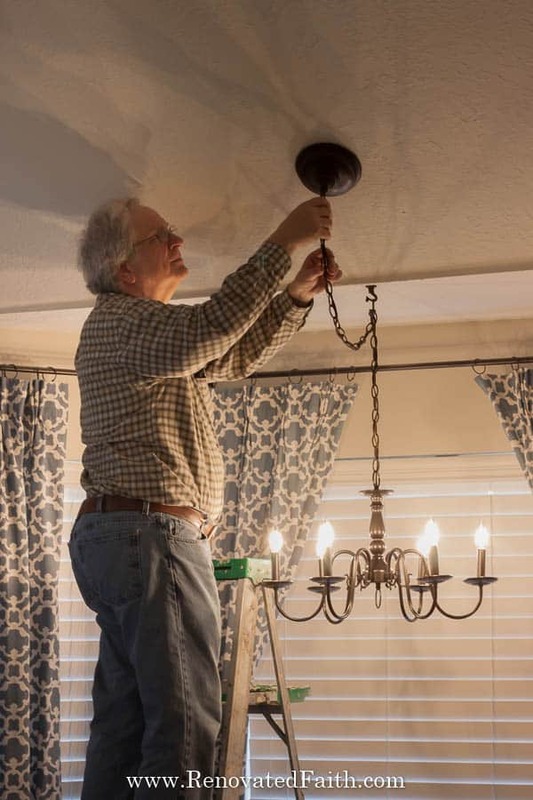 Now put your first coat of spray paint on the rest of the chandelier. Wait 10-15 minutes and do a last coat before letting it dry 48 hours. With the help of my dad, “we” hung the chandelier and I just screwed in the new bulbs. I love these new LED bulbs because they look like Edison bulbs but are much more long-lasting. You can find them cheaper here than in your local home improvement store. I love how it turned out and that it is similar to the chandelier in our dining room in front of the restored china cabinet. However, this one only cost us just over $10! It was now time to turn my attention to the chandelier over my island. It is huge and gives a dramatic effect but those coffee colored shades HAD to go. 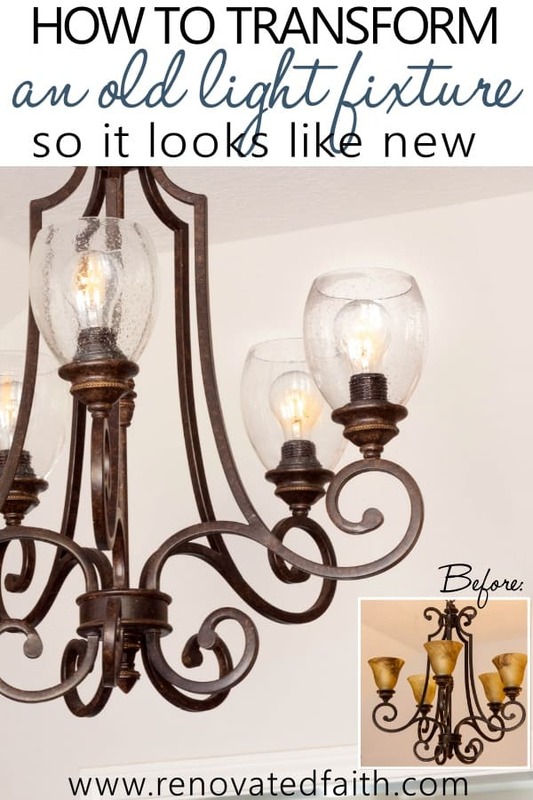 Instead of replacing the whole fixture, you can often just replace the shades (the glass sconces) and it will make a drastic change to the look of the whole light fixture. 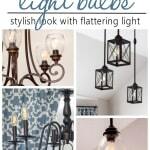 Glass Light Shades – These clear seeded glass shades are cheapest at Lowe’s here and they are also here online. Rustoleum Universal Metallics Oil Rubbed Bronze Spray Paint – You can get it here or at most home improvement stores. Rustoleum Painter’s Touch Ultra Cover in Oil Rubbed Bronze (optional) – This is for painting the threaded socket covering for the bulbs. You can also spray some of your spray paint into a plastic cup but this is SO much easier and great to have on hand for touch ups around the house. Sharp scissors – I love these and have two pair. LED Light bulbs – the new ones that look like Edison bulbs you can find cheap here. Turn off the light and unscrew the light bulb. Now unscrew the little ring that holds the glass in place. Hold onto the glass as you unscrew it. There might also be a spacer ring behind it. Now you are going to spray paint your rings, spacers and thread covers. 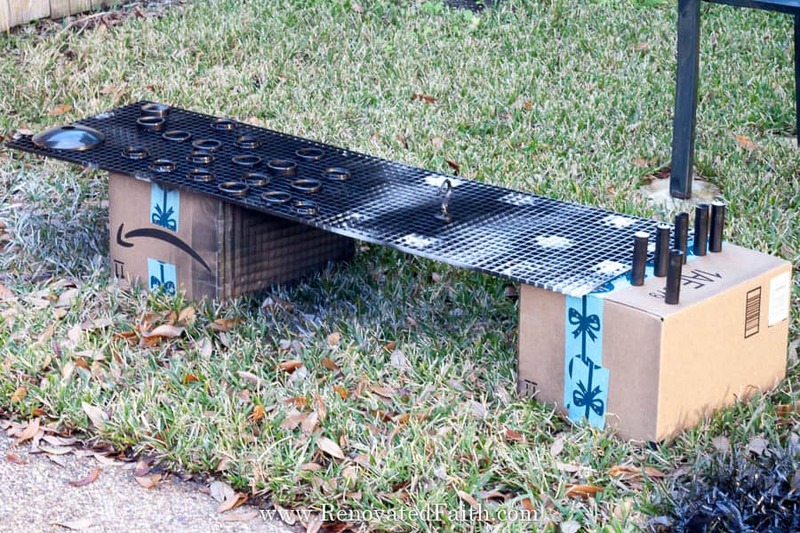 Lay them out flat on a piece of cardboard and lightly spray them with the same Rustoleum Universal Metallics Spray Paint. Let them dry 15 minutes and then add another coat if needed. Then let them dry 24-48 hours. I’m updating my light shades to clear seeded glass. There’s only one problem with clear glass – you are going to see those white socket threads and white rings underneath your light bulb. This is not a huge deal but I like the idea of covering those so everything about the fixture looks intentional and has a consistent look throughout. Trust me, it will make all the difference! 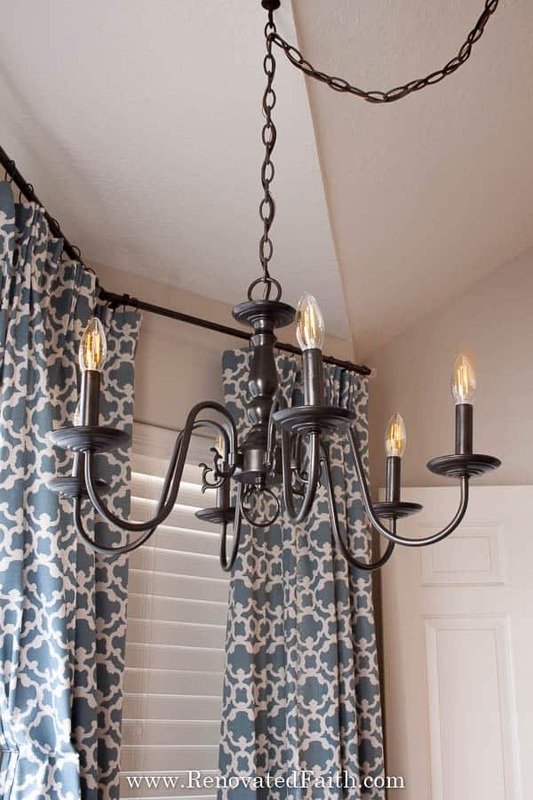 So, this easiest solution is to paint them in the same color of your chandelier. You can do this one of two ways. Just paint the sockets with a small brush and throw away the brush when you are done. Don’t they look better now?!? Oh how I love consistency! Now, add your new glass shades, your spacer (if you have one), and the ring before screwing in the LED light bulb. 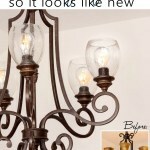 Turn on your light and see what a fabulous change this has made to your entire light fixture makeover! 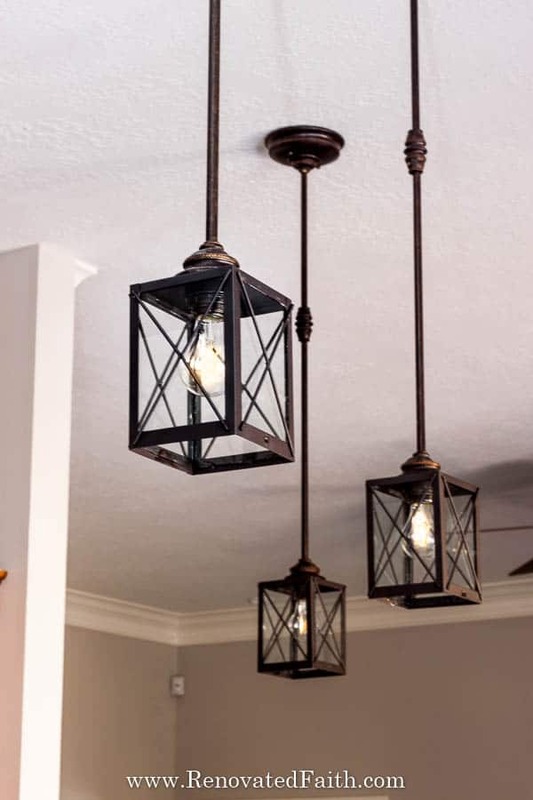 When a reader asks me how to paint an old light fixture,I’m quick to ask them how their lighting would look if they just changed the shades (the glass sconces). 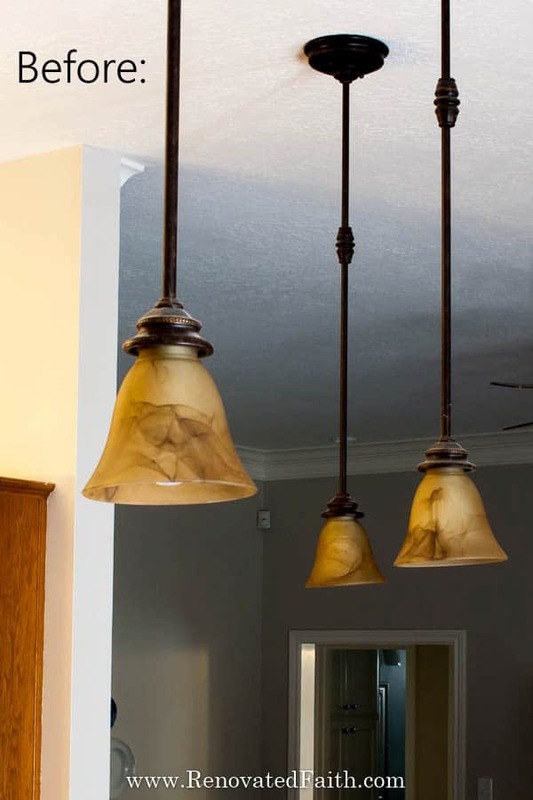 After the master bath makeover, I knew I could give these pendant lights a new look at a fraction of the cost. 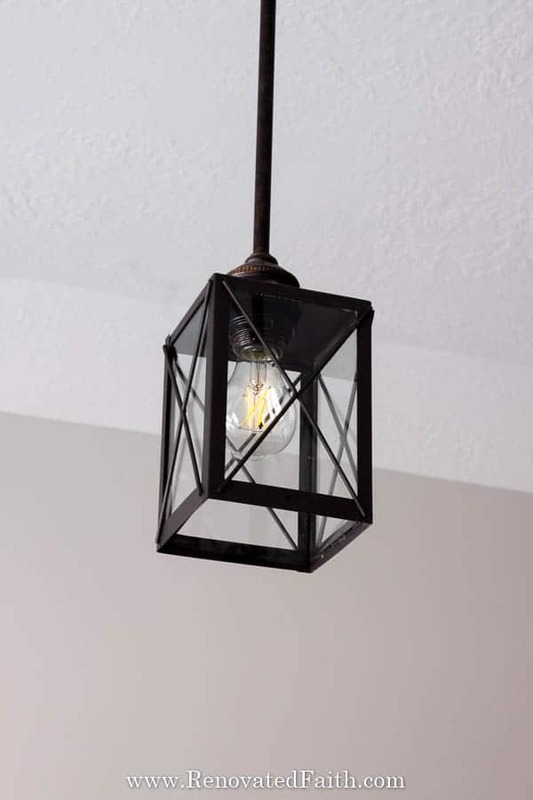 Instead of buying new pendant lights or spray painting the entire fixture, you can more easily modernize your kitchen lighting by adding a new sconce shade like the process above. 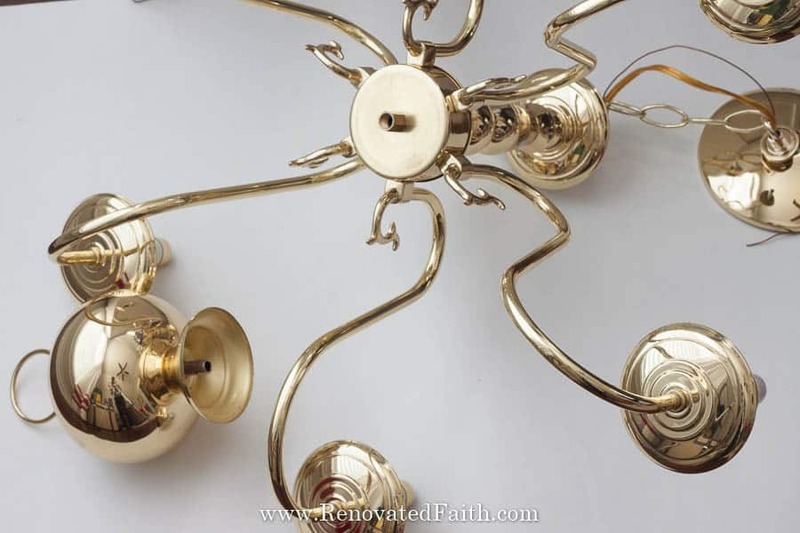 Here are how my pendant lights looked before their makeover. Yes, you can say it; they were horrible! Here is how they looked after using the same process as I used for the chandelier over my island. It’s amazing how a small change can make such a huge difference. 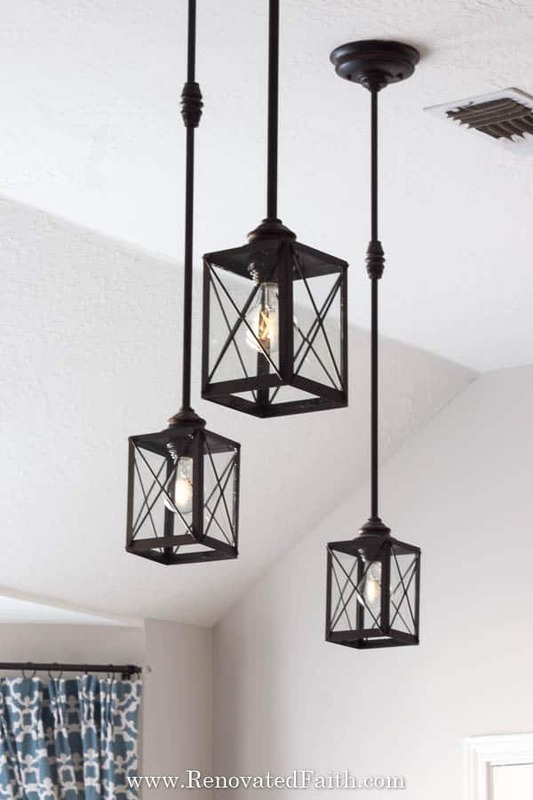 Because clearly I can’t leave well enough alone, I decided I wanted the look of those adorable lantern light fixture covers for the pendant lights over the counter. Here is my inspiration but I’m no so inspired by the steep price tag. 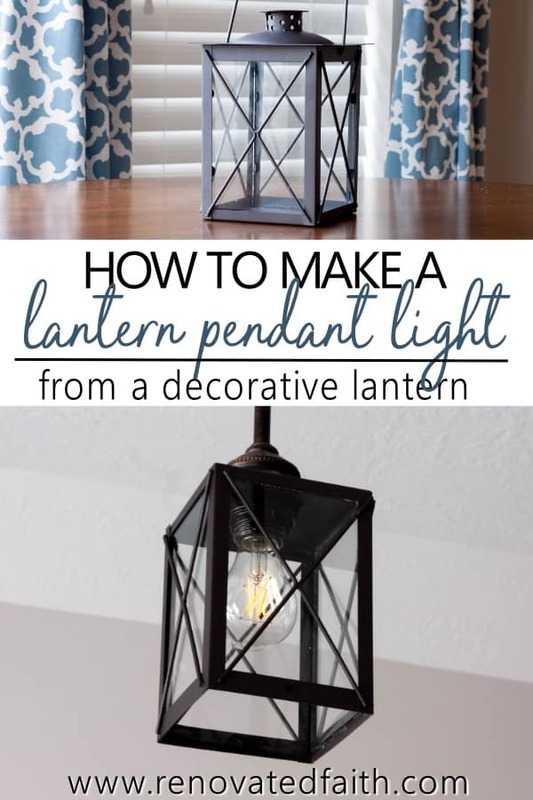 So for this DIY light fixture update, I made my own out of decorative lanterns I got online here! 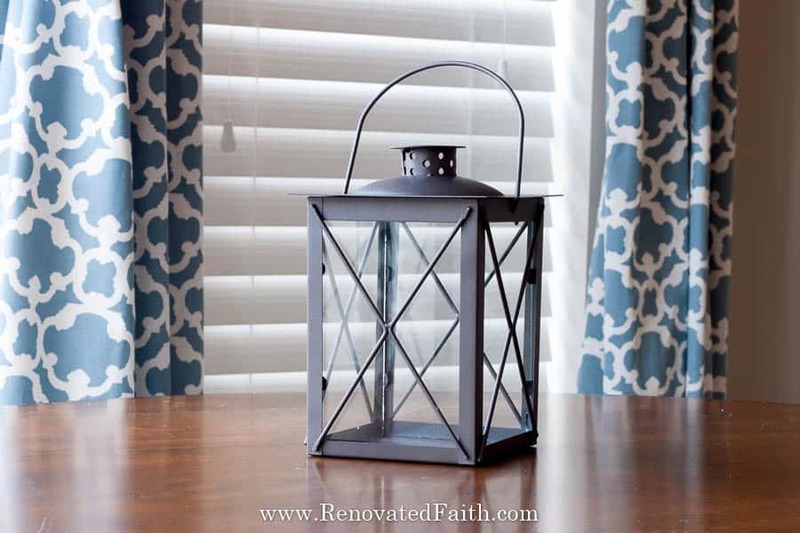 Decorative Lanterns – I used these (check the current price here). The price is definitely right as they aren’t much more than clear light shades. 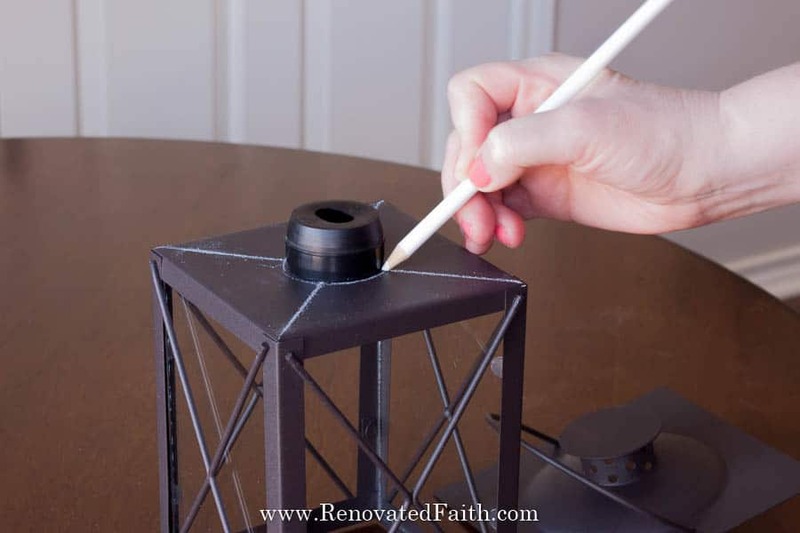 (If you decide on another lantern, make sure the top is removable. 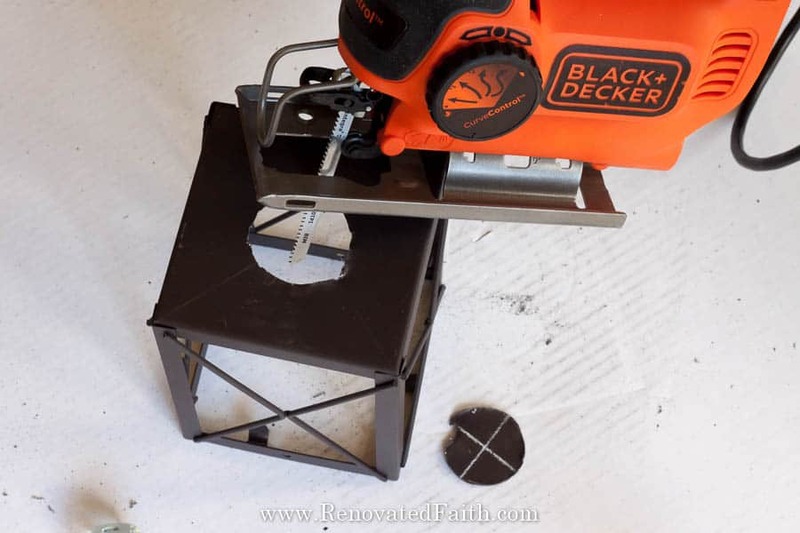 Jig Saw – This is what I use and it is inexpensive. Rustoleum Universal Metallics Oil Rubbed Bronze Spray Paint – You can get it here you can get it at most home improvement stores cheaper. LED Light bulbs – the new ones that look like Edison bulbs can be found cheaper here. Unscrew the bulb and while holding the shade with one hand, unscrew the metal ring with the other. Now you are going to spray paint your rings, and spacers. 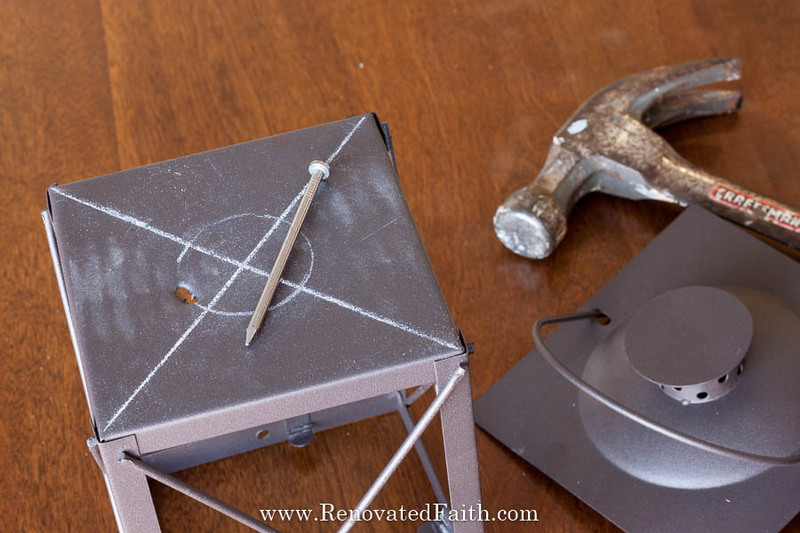 Lay them out flat on a piece of cardboard and lightly spray them with the same Rustoleum Universal Metallics Spray Paint for the last DIY light fixture update. Let them dry 15 minutes and then add another coat if needed. Then let them dry at least 24 hours. 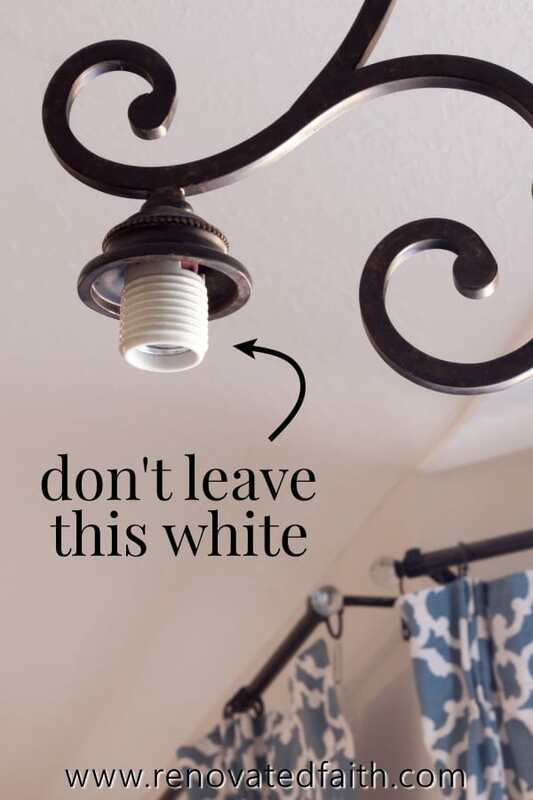 Just like the instructions for the last light fixture makeover, you are now going to paint those threaded socket covers since they will be showing. Use either your spray paint or the quart of Rustoleum ultra cover listed above and paint the sockets with a small brush and throw away the brush when you are done. We are flipping the lantern over at this point and the bottom will now become the top. 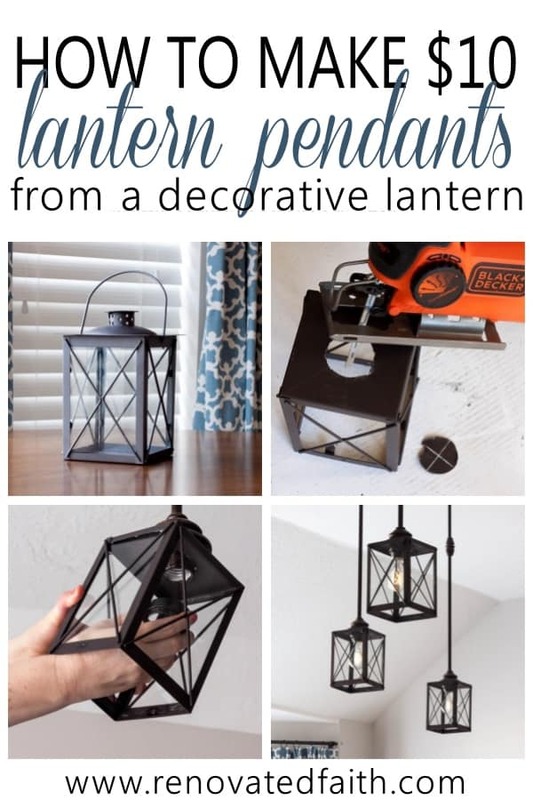 While those are drying, you are going to make a hole in the top of your lantern with a jig saw and jig saw blade. 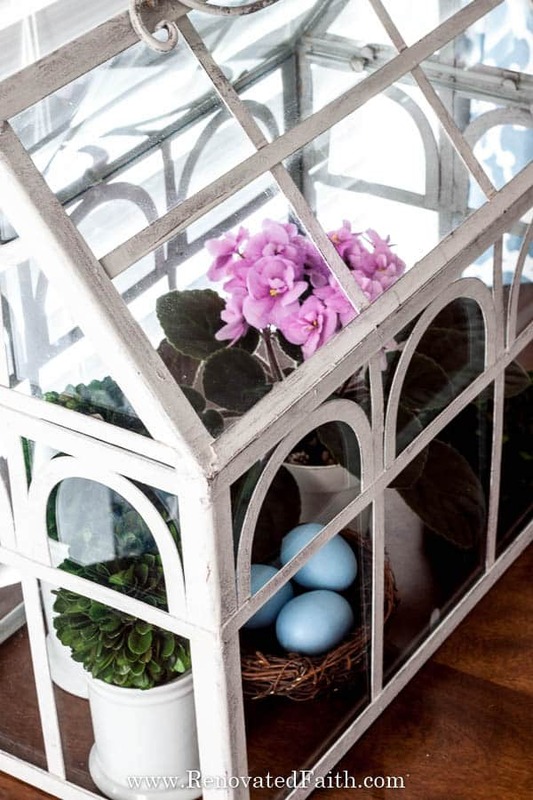 Take out the glass panes and set them aside. See my post on how to use a jig saw here where I show you how easy they are to use. Cutting through metal is the same as cutting through wood, you just use a different blade like this one and it’s a little louder so you might wear ear plugs. I cut a hole that was 1.25″ in diameter and marked the hole with a pencil, making sure it was in the center. I started the small hole by hammering two nail holes into the top of the lantern along the line so the blade will have a place to go in. Now you can secure the lantern with the ring that you spray painted earlier. As I took pictures of the new light fixtures I was noticed my little African Violet in the terrarium on the breakfast table. I have to be careful to turn it every few days, because if I’m not careful all of it’s leaves will turn towards the light and the plant will look lop-sided. Have you ever noticed that no matter how many times you try to turn a plant, it will always grow towards the light? That plant doesn’t have a brain, a weekly planner or even an alarm clock but it knows that no matter what, it needs to turn it’s leaves toward the window if it wants to grow and thrive. 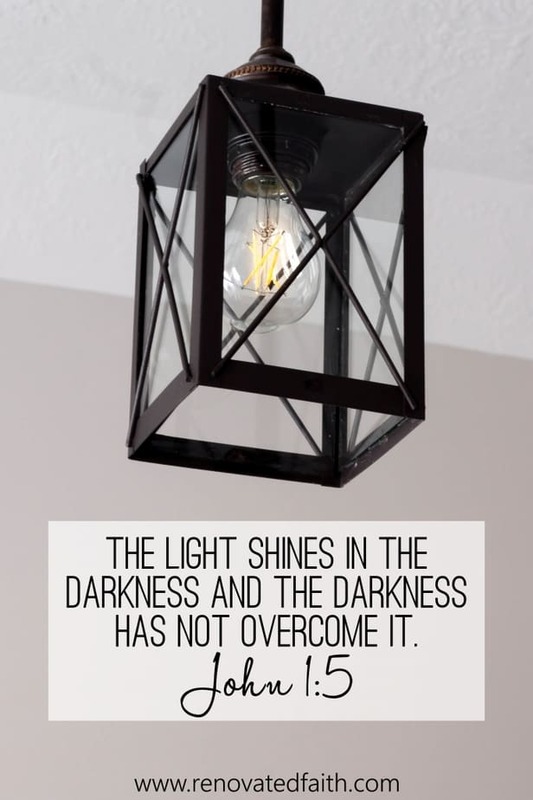 As I was hanging up my new light fixtures, I couldn’t help but wish I could be like that little plant – always turning towards God, day in and day out – no matter the situation. But sometimes I turn away… I turn away from the one thing I need most because sometimes I feel a little overexposed. What about you? Do you hide your feelings or problems from God? 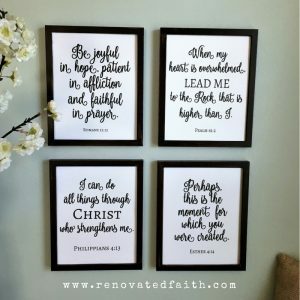 Do you feel like what you have to offer Him isn’t worthy of the light of day? But fortunately, there is nothing too dark or twisted to share with Him – no worry, concern or fear He can’t subside. We lie to ourselves when we feel like we can hide from Him. For nothing is hidden from the warm embrace of His love. He waits for you ready to bear your burdens, ease your pain and forgive your sin. From the beginning of time, He foreknew what would hide in your shadows but sent His Son to die for you anyway. He wants you to walk with Him, head held high and turned towards Him. For in the light of His presence, we find forgiveness and fellowship with Him, without the darkness of shame, burden, or regret. No matter what lies ahead, may we follow our Heavenly Father with confidence, enjoying the warmth of His love in the light of His presence. LED light bulbs are definitely here to stay. They are long-lasting, and safer than incandescent bulbs AND compact fluorescents. However, the lighting from LED bulbs can be pretty harsh and not very flattering. Also, the white plastic covering on the bottom half of many LED’s makes them look tacky in clear fixtures. Fortunately, I stumbled upon a new type of LED called Filament LED, or Edison LED bulbs. They have the appearance of Edison bulbs but are true LED’s instead of just fancy incandescents. They come in various shades of lighting and are not nearly as harsh as their LED counterparts. They are more expensive than the traditional LED bulbs but not by much. 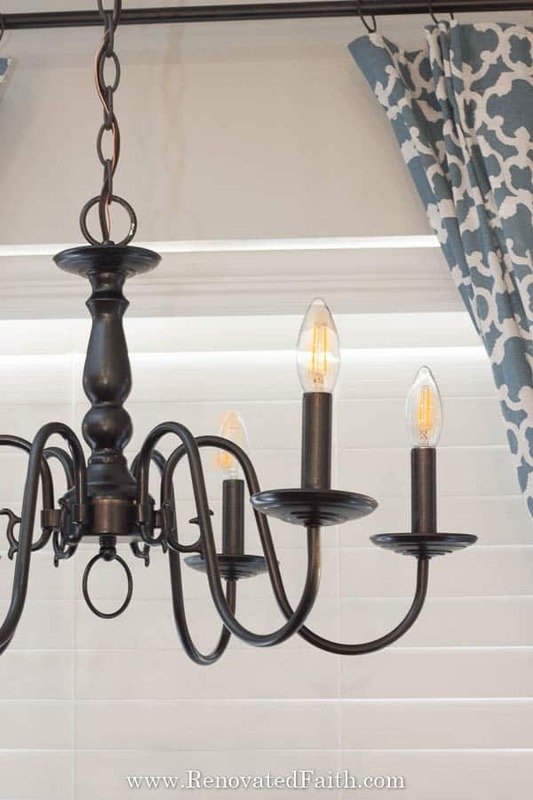 To see the specific bulbs I used for my light fixtures, go to the supplies list at the top. Click the linke below for Amazon listings cheaper than in home improvement stores. 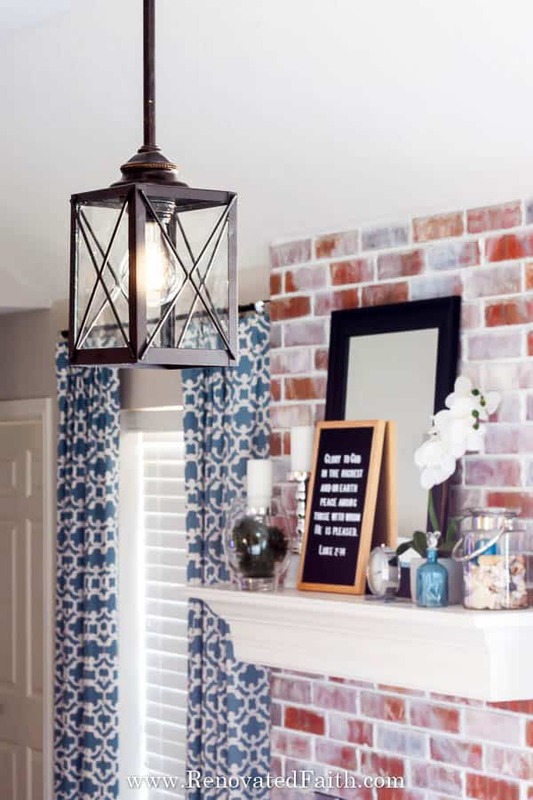 You might have unsightly wall sconces in your halls or entry ways. 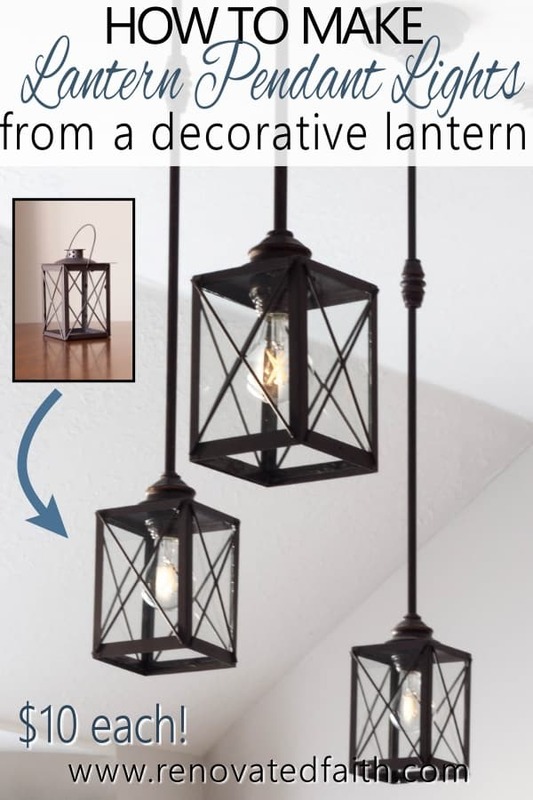 These can be updated with the lanterns or even the new pendent light covers I described above. Read over those tutorials at the beginning of this post to see what option best fits your style. After these projects, I have an old light fixture and over a dozen old glass shades lying around. I plan on donating them to my local Restore where they can resell them and use those funds to build homes for people in need. 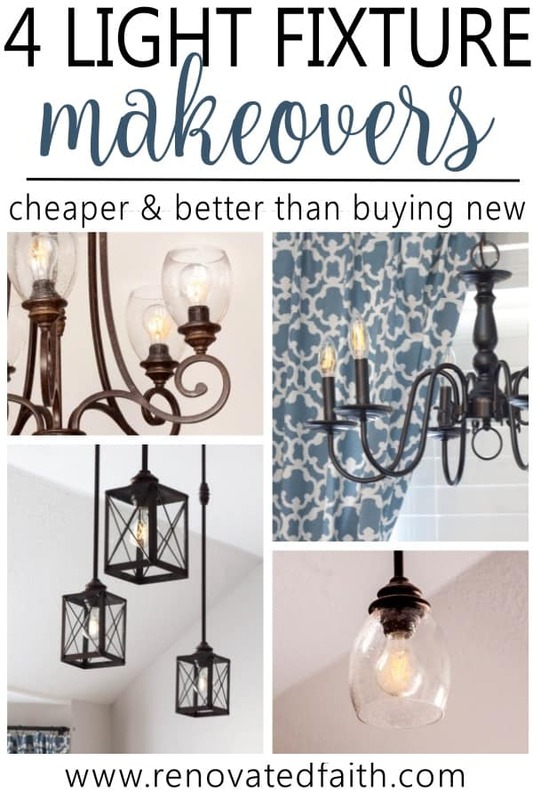 These four light fixture makeovers have hopefully given you ideas to instantly update your current fixture while saving a ton of cash that can be used elsewhere in your home budget. If you are new to spray painting, no worries! The spray paint brand I used above is SUPER easy to work with. I promise, you will have flawless results. 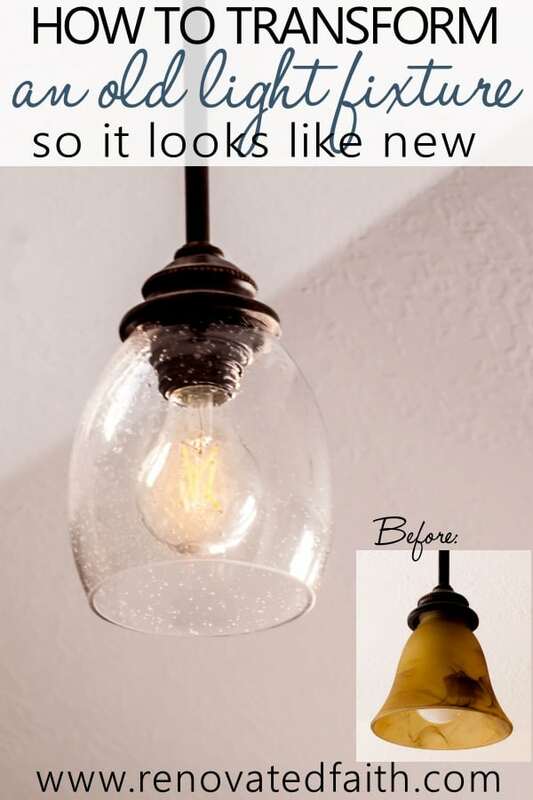 Now, head to your local Re-Store or home improvement store to start your own diy light fixtures updates! 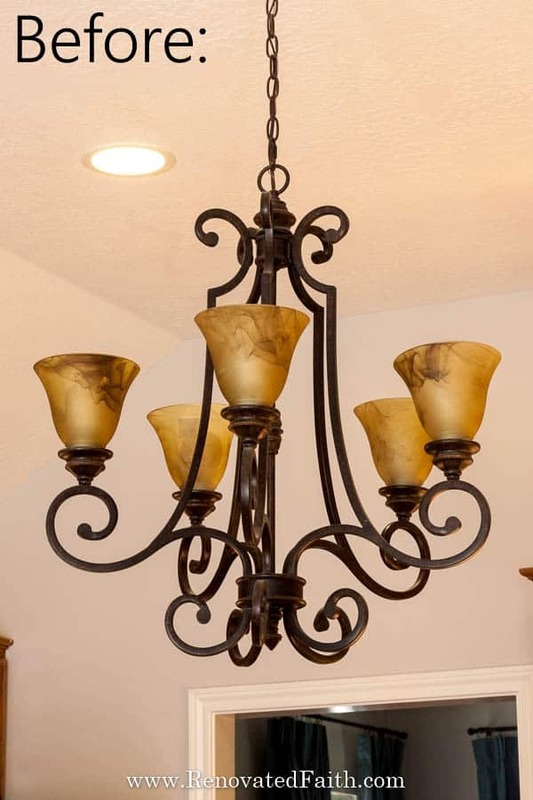 All your light fixture conversions are great improvements. You did a good job. Thank you for your words of inspiration. Thank you so much Robin! I so appreciate that and I’m praying for your recovery! I came across your info on pinterest and from the first words you said I could only think I needed to reach out and tell you what a blessing you are. I know you have heard this many times before, but the way you share your love for the Lord in what you do, in such an open and elegant way really blessed me! May God continue to inspire and bless everything you do! Wow, I’m really just humbled by this and can’t thank you enough for your kind words. I appreciate it more than you know!